One review took my breath away. It’s not a typical review by any means but one written by a student who writes daily and aspires to write fiction. I’ve received his permission to publish his review in its entirety. The Germany-based Morgenstern Trio performed at the McCoy Theatre of the Maui Arts and Cultural Center on Friday October 24, 2014. As usual, it was the ONLY classical concert with a piano in it that I knew of, back in August 2014 when the 16-week semester began. As such, I urged my piano students to save the date. Every semester, I require my students to attend an approved concert and write a review. At the end of the term, I extract the best bits, edit, and post a blog here. One review stood apart from the rest. It’s not a typical review by any means but one written by a student who writes daily and aspires to write fiction. I’ve received his permission to publish his review in its entirety. Jason Mraz’s “I Won’t Give Up” is a ballad suitable for arpeggio accompaniment, in the key of E major. Jason Mraz’s “I’m Yours” is very suitable for piano ensemble. One group can play the melody. The other can play the reggae shuffle accompaniment. The same four-chord progression is repeated throughout, with a few interruptions of a fifth chord at predictable spots. I discovered Jason Mraz one night watching “The X-Factor” and other talent contests on Youtube. His “I’m Yours” sounded very familiar, for the ukelele version that’s played in the Hawaiian Islands. 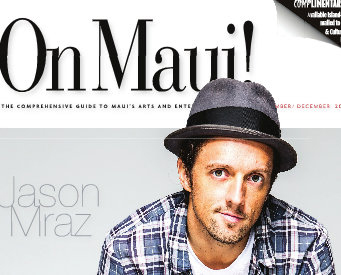 Then I saw his face on the cover of the latest edition of “On Maui” magazine. Microphones on stage are not always used to amplify. They can exist to record. It’s fairly easy to tell if the sound from a musical instrument is amplified or not. You hear the amplification through speakers. It sounds different when amplified. Dancing makes me feel alive and free. And it also brings back many fond memories. In the “mixers” the women line up and wait for their turn to dance with a man who leads in a dance around the room until it’s time to join the queue again. This is Maui on a Saturday evening on the parquet wooden floors of the Omori Dance Studios at the Maui Arts and Cultural Center (MACC). In London, it was the opposite — the women were in short supply at Friday night CEROC dances, and the men had to queue for their turn.